Very often the most important factor in polling is not the data but how it is used. There can be few better examples than today’s Mail on Sunday coverage of its Maria Miller polling. The paper, like the Telegraph and the Times yesterday, is after her and Miller’s survival chances won’t be helped. The key numbers from the Survation poll are in the chart. Generally whenever a politician comes under pressure and we get questions like this then the polling is split on party lines. Those sampled tend to respond in line with their allegiance and are generally less ready to condemn one of their own than the public as a whole. Not so with the Miller numbers. On two of the three questions Tory voters are more hostile than the overall sample. Even the question here about Cameron standing by her sees CON voters being more harsh than the overall sample. I can’t recall this ever happening before and that can only add to the pressure on the culture secretary. If this media pressure is maintained then it won’t be long, surely, before she’s gone. Why do so many Tory MPs have second jobs? Ed Milibandâ€™s decision to clamp down on the number of Labour MPs who have second jobs caused some surprise the other week. Following the 2015 general election no Labour MP will be able to work more than the value of 15% of their salary. Miliband called on other parties to follow suit. The way this story was reported suggested that if this policy was a stealth attack on the Conservative Party. But why? There are a number of Labour MPs who have second jobs and additional earnings in recent years. Gordon Brown donates all of his Â£1.37M of outside earnings to charity which is preferable to financially profiting himself, but thatâ€™s still not fully satisfactory. Heâ€™s either an MP or heâ€™s not. Most recently former minister David Blunkett has decided to cash in for Oracle Capital Group while still serving as an MP. Conservative MPs profit four times as much as their Labour counterparts. 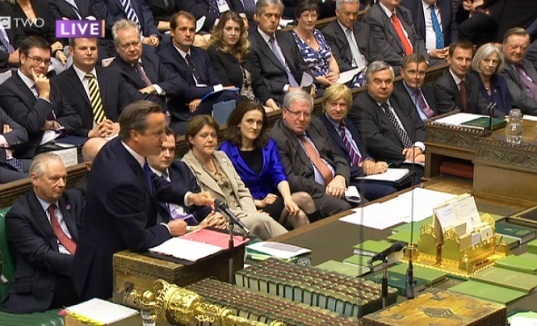 Conservative MPs have personally benefitted from Â£4.3M of outside work. Why is it that so many more Tories think it is acceptable to profit from these directorships, consultancies and outside work? Nadine Dorries received a huge amount of criticism for her appearance on a reality TV programme, but far less visible is the very well paid consultancies of her colleagues. Geoffrey Cox took made Â£417,000 from his work as a barrister alongside being an MP. Was Nadineâ€™s crime a lack of discretion? How that must have grated with her. Perhaps the typical Conservative MPâ€™s constituencies arenâ€™t as demanding as those in less affluent constituencies of Labour colleagues who have to deal with huge volumes of case work on benefits, immigration and housing matters? But there must be issues of concern in true blue heartlands that need raising? Surely Conservative MPs would want to be pressing for new policies or legislation on issues that matter to them while their party is in office? Or at least trying to curry favour for promotion? Diligent Lib Dem MPs donâ€™t have time to take up such paid work. Theyâ€™re more likely to be found either in government or are tramping the streets defending their seats. The argument put forward by some is that additional jobs enhance their work. I find that hard to swallow. If it does assist their job then do it for free. I donâ€™t see any MPs taking on minimum wage jobs or volunteering in a food bank as party of their additional activity to inform their work. Is it really a coincidence that almost all the additional jobs come with a bag of swag? When Lynton Crosby was to give the Conservative Party impartial advice it would be to emphasise the partyâ€™s sense of public service in â€˜making tough decisions to put the country on a firm economic footingâ€™. They should be following similar proposals to those of the Labour leader in the run up to the general election and try and demonstrate how they have some inkling of how the other half live. Cameron’s dismissal of a limit to MPâ€™s additional earnings suggests he doesnâ€™t want to ruffle the feathers of his backbenchers, making him a sitting duck. Labourâ€™s position on second jobs wasnâ€™t a throwaway line in a speech or some summer parliamentary antics â€“ Ed Miliband is deadly serious about it. Heâ€™s right to do so. So many moonlighting MPs undermine parliament and diminish further the standing of MPs. Something stinks when affluent MP preach the need to cap the benefits of the poor but not their own earning power while theyâ€™re MPs. If the Liberal Democrats had any sense then theyâ€™d follow suit and back the Ed Milibandâ€™s proposals. Itâ€™s ethically and politically the right thing to do. So will Barnsley Central be the next by-election? And will Labour’s ratings continue to be untouched? Today at Southwark Crown Court the only sitting MP to face charges from the expenses scandal, Eric Illsley, pleaded guilty and so paved the way for a possibly by-election – the second of this parliament. If he receives a jail sentence of a year or more than he’ll cease to be an MP thus opening the way for a new contest. The court will give its ruling on this in four weeks. On the face of it the seat looks a copper-bottomed Labour hold and the only interest might be from the BNP. The table above shows what happened last May. So far Labour’s position has hardly been touched by all of this – it’s old news from when a different regime was in charge. Is that going to continue? Probably. Is this the most high-profile case so far? 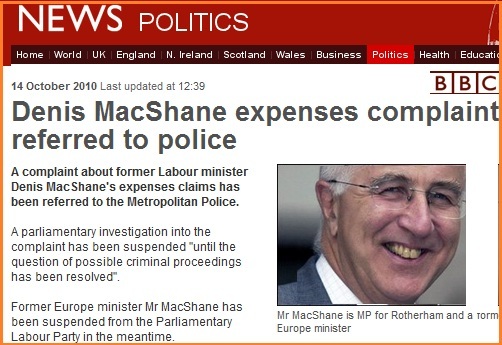 What a busy morning for political news – the squeeze on high-earners pension contribution; the bonfire of the quangos, and now the news that high-profile former minister, Denis MacShane, has been suspended from the parliamentary Labour party after the Commons Standards and Privileges Committee, agreed MacShane’s conduct should be reported to the Metropolitan Police. Denis, who I knew well at the BBC in the late 1970s, is by far the highest-profile MP to have been referred to the police and my guess is that he will get much more coverage than other cases. MacShane’s immediate suspension from the PLP contrasts sharply with the appointment at the weekend of Phil Woolas as a shadow minister. Woolas, the Oldham East and Saddleworth MP, gets the verdict in his case on November 5th. Is a decision on David Laws imminent? Could he be back in his old job by the autumn? One betting market that could soon be coming to fruition is the one on whether ex-LD Treasury Secretary, David Laws, will return to the cabinet before the end of the year. He had to stand down, of course, following allegations about his expense claims for housing costs. This has been prompted by newspaper reports that he’s now part of a group of key Clegg advisers and efforts are being made to test the water about a possible return. In his short time in the job Laws became absolutely central to the coalition and his having to stand aside was a serious blow from which it has not really recovered. It was Laws, it will be recalled, who revealed the Liam Byrne letter about there being no money left. His presence at the Treasury and his approach to the task did more to ease Tory concerns about the coalition than just about anything else. Laws being on side made the compromises that the blue team coalition doubters had to make that more palatable. Having someone who was apparently so respected by the other side also eased tensions within Clegg’s party. However much both coalition partners would like to see Laws back it would be political suicide, surely, to do anything before the conclusion of the Parliamentary Standard Commissioner’s investigation. If Laws comes out of that relatively unscathed then he’s probably okay. But if it’s anything else then it might be more difficult Maybe this is being speculated about at the moment because they’ve had an indication about the outcome from the way the inquiry has progressed. 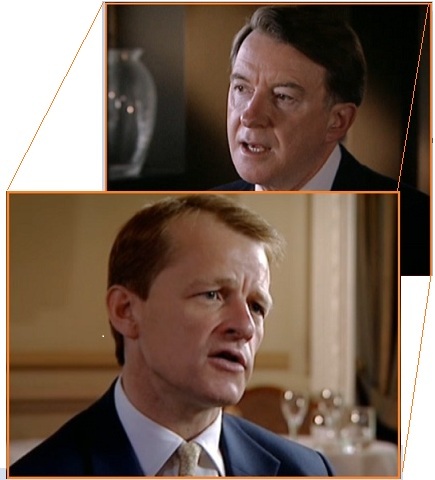 No doubt that if Laws does return, the coalition spinners will remind everybody of Peter Mandelson’s first resignation, which also related to housing finance, from Blair’s team in December 1998. He, of course returned to the Cabinet in less than a year – only to be forced out again in 2001. Is it going to happen? I don’t know but it looks as though it might – and if that happens then the next cabinet casualty will be Michael Moore who took on Danny Alexander’s job when a new treasury secretary was needed. 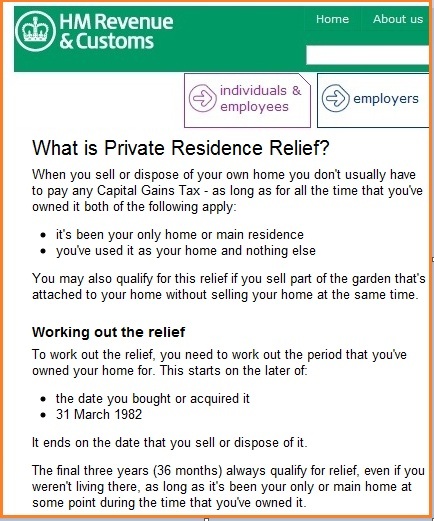 Should the Telegraph have checked with the HMRC first? Are they trying too hard to find a story? There was a lot of heated argument on the overnight thread about the basis of Telegraph’s splash lead attack the new Treasury Secretary, Danny Alexander. That was the case with Mr Alexander who essentially is being accused of not paying a tax when no tax was due. 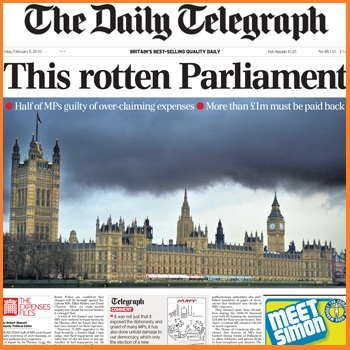 Over the past fifteen months the Telegraph has done a great job with its MPs expenses investigation and there’s a sort of assumption that if you are named in a splash lead like this then you are “guilty”. This case is not about flipping or some of the other practices that were revealed. I believe that the paper was trying too hard and that could undermine its credibility with further exposes. Can I thank alex on the previous thread for digging up the relevant rules and regulations. Will “others”, UKIP/GRN/BNP, really get a boost from this? Or will they be squeezed out in the Dave-Gord encounter? 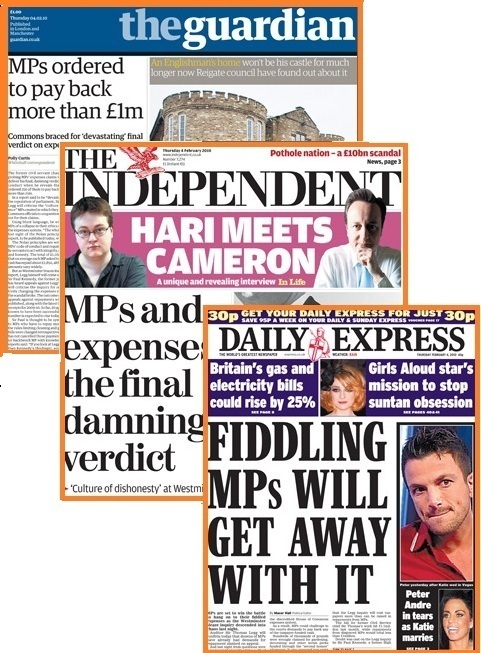 The general view ahead of the June 2009 Euro elections was that the parties that would gain most from the expenses scandal, which dominated the headlines for the weeks beforehand, would be UKIP, the Greens and the BNP. And so it was. UKIP easily beat Labour for second place in the national vote, the Greens had a good election while the BNP secured two seats at the EU parliament for the first time. But can we assume the same for the general election – where there’s the first past the post voting system and where the battle will be framed by the media as the Dave and Gord show with a bit of exposure for Nick Clegg? And unlike last June when the electoral system meant that voting for one of the others could increase their chances of getting a seat that’s only going to apply in two or three of the 650 Westminster battle-grounds. For the harsh reality is that votes for the minor parties are almost certainly going to count for almost nothing on May 6th – if that is indeed the day. And if there’s little point in turning out then the chances are that electors will be more reluctant do so – expenses scandal or not. Interestingly the PB/Angus Reid polls, which don’t weight by likelihood to vote, do put the following options to those who’ve expressed a party choice – “I will definitely vote for this party” or “I could change my mind before the election takes place“. Every survey that we have done has had supporters of the “others” responding that they are much less likely to opt for the former than Tory, Labour or Lib Dem supporters. So my guess is that in spite of the expenses scandal the overall shares going to UKIP/GRN/BNP will not be that much greater than 2005. The big difference is that the best known figure in each of these parties is in with a fighting chance in Buckingham, Brighton Pavillion and Barking respectively – so one or more could see an MP elected for the first time. I’ve got money on Farage and Lucas. There is likely to be a bigger focus on independent candidates which could in certain seats be talked up by the media. By polling day, however, the election will be seen as a sharp choice between the main parties in England with the addition of SNP/PC in Scotland and Wales. There’s also the question of the impact of the scandal on turnout – which I’ll cover in a separate post. Are we going to see a “reverse incumbency” effect? What’s this going to do in individual key seats? So here we are – what many MPs are hoping will be the low point for them in the whole expenses saga – the publication today of the Legg Report. Until we see the actual document we won’t get the full scale of what he’s concluded but it seems that up to half of all MPs will be ordered to pay back between them about Â£1m and that Sir Thomas himself will have some stinging words about the system and the ethics of MPs themselves. What’ll make today so marked is that as well as being the top national story there’s a strong local angle for almost every news organisation in the land. The specifics for each individual MP will be big news on their home patches. With this happening so close to an election it’s almost bound to have an impact everywhere. In electoral terms this is a much bigger challenge for Labour than the other parties for the simple fact that it’s got a lot more MPs. There’s also the potential for this to rub off more on the party in power. For the Tories the national swing should contain the damage in all but perhaps a handful of seats where there have been very specific problems. The general theory, backed up by election after election, is that incumbent MPs get an electoral bonus. Could this affair see that produce the opposite. Will 2010 be marked by the “reverse incumbency effect”? We might see a lot of movement on the constituency betting markets in the next 24 hours. My best advice is to stick with seats you know and don’t over-react.